There is quite a bit of confusion surrounding how to convert Le Club Accorhotels (the Novotel, Ibis, Sofitel, Mercure etc programme) points into Avios. With the help of HFP reader Tony, I have got to the bottom of it this week. Tony and I have confirmed that you can convert ANY Accor balance into Avios. You do NOT need the minimum of 3,000 points as stated on their website. However, you need to follow a specific route. I can confirm that the Iberia ratio of 1:1 is accurate. It is therefore essential that you open an Iberia Plus account via the Iberia website and send your Accor points there. You can then move your Avios from Iberia Plus to BAEC via ‘Convert My Avios’. If you click through and select Iberia Plus, your current balance – assuming you have at least 3,000 points – will be transferred to Avios immediately. It will round down to the nearest 3,000 points and leave the remaining points in your account. 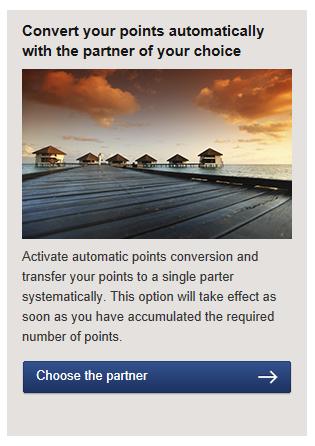 If you do not have 3,000 Accor points, it won’t work. You need to use Plan B! Don’t ask why what I am about to show you works. Just trust me, it does work! Step 1: Go to this website which promotes an airberlin offer for Accor. Step 3: You will be taken to the usual Le Club Accorhotels log-in page. Follow the same steps I outlined above – click on ‘Manage My Account’, ‘My Loyalty Card’ and then ‘My Rewards’ – and then click on the same box I showed above. Add your Iberia Plus details. The only difference between these two processes is that, for balances under 3,000 Accor points, you need to go to the Accor website via the airberlin page I link to in Step 1. This was from the account of my wife. Her Accor account dropped to zero points. Within 24 hours, her 2,800 points had been deposited into her newly opened Iberia Plus account at a conversion rate of 1:1. If you do not want points from future stays to be converted automatically, change your earnings preference back to points following the steps in Step 3 above and click on the other box this time! 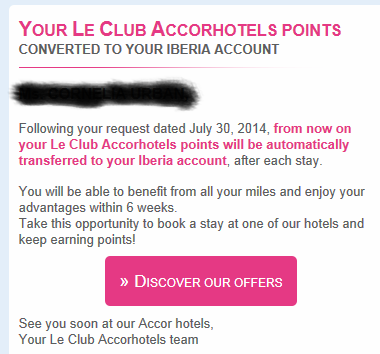 My ACCOR points finally arrived into my IBERIA account! NOw, I guess, as that account was previously zero, I have to wait ages before I can move then anywhere.